Prince’s music remains difficult to find for free on the internet, and it’s a hard thing to complain about when you consider his musical talent and incredible writing. So when I was trying to find a good video to link here, I was thwarted. That’s okay though, because we all know the song and the fact that if it was warm she wouldn’t wear much more. Brilliant. When this frame came back Champion Powdercoating the Raspberry Beret connection was instantly obvious. We thus attempted to build it up in a way that would accentuate the frame’s color; everything else on the bike exists pretty much in deference to the Raspberry. Comparatively boring is the fact the the bike is nicely equipped with all new parts, including a simple and reliable 3-speed drivetrain, comfortable saddle, and nice-looking gumwall tires. If anyone’s curious, the frame is a Raleigh Super Record from the late 70’s/early 80’s. It most certainly predated Prince’s 1985 album Around the World in a Day, on which “Raspberry Beret” appeared as the single. Charted at #2 on the U.S. Billboard Hot 100. To be sure, there are lots of different raspberries out there. You’ve got black raspberries (not too common here, though blackberries are presently in season and if you’re hungry, head on up to McLaren Park to pick some), golden raspberries, and even yellow raspberries. But I think it’s probably safe to say that when Prince was writing the song, he was picturing the lady in a beret just about the color of the bike you see here. Though the bicycle does not come with a beret included, we can recommend a number of fine fashion establishments nearby where you could find an appropriate one. I guess that’s about all you’ll need, then, especially if it’s warm. While shopping a while back I purchased a bottle of what I assumed to be olive oil, based on the presence of those words on the label as well as a prominently displayed Italian flag. It was only when I got home that I discovered it had been blended with canola oil, reducing it from prime bread-dipping status to mere general-purpose frying duty. 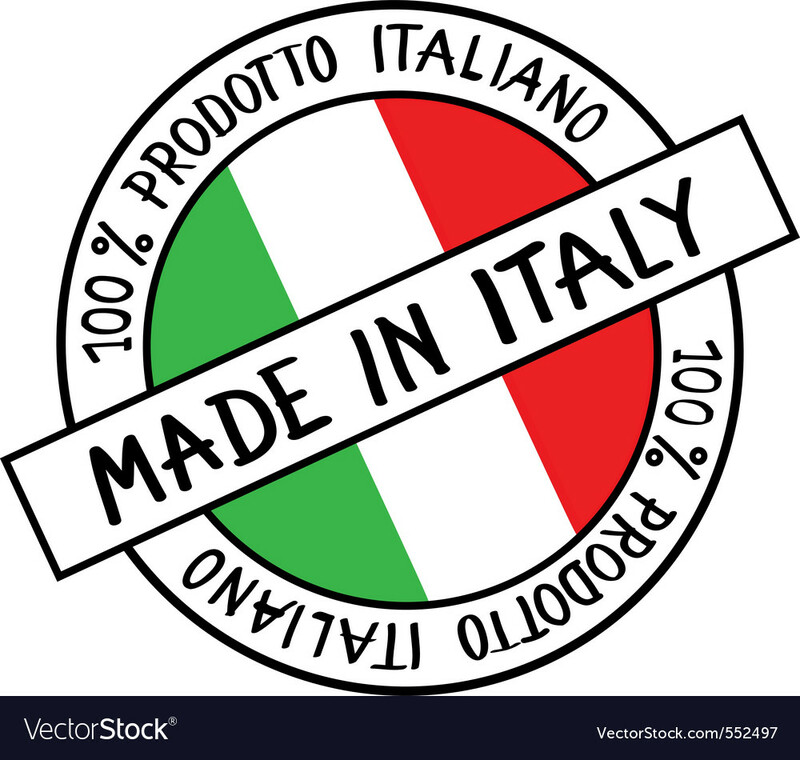 While the Made in Italy label does seem to gain the immediate attention and respect of the average American consumer, I hadn’t even seen that. Just the flag. Enough to buy the item. You won’t see an Italian flag on this Novara Trionfo, but maybe its Italian name is enough to lure you in. And in that case you won’t feel duped as I did, because this is very nice, classic steel road bike–not some off-brand fry oil lurking in the back of your kitchen cabinet. Also of note is the internal cable routing. As a mechanic, it’s sometimes hard to feed the brake or derailleur cable through these small holes. The makers of this frame, a late-1980’s model, took the trouble to design this feature well. The cable went through perfectly, and I didn’t even have to bother to slightly pre-bend the end of the cable to help it find the exit. The Trionfo was stripped the the bare frame and fully rebuilt with more modern parts. A size-appropriate 165mm crankset has been installed, as well as some narrower 38cm Soma Highway One handlebars. It’s also got a nice set of 700 x 25 Gatorskin tires that should hold up well in our glass-strewned city. Come check it out today! A good fit for someone right around 5′ tall. 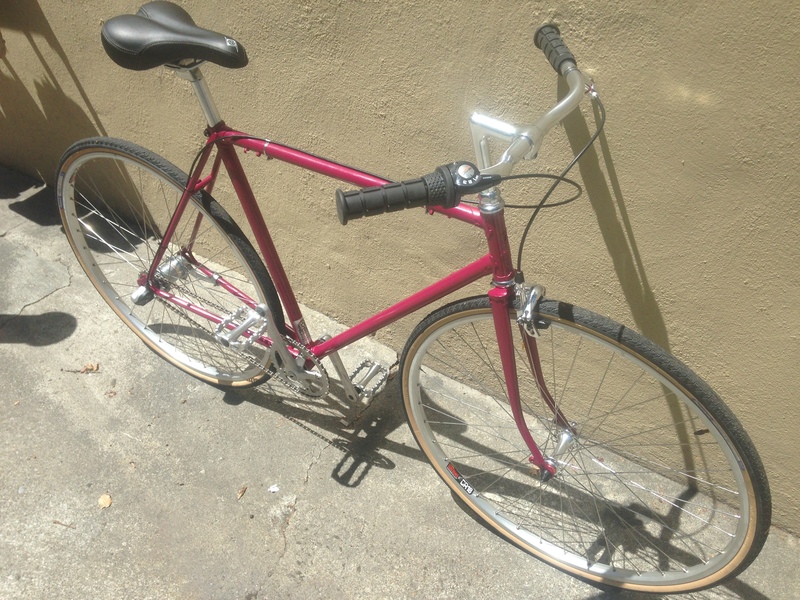 Several weeks ago we had a customer come by the bike shop to donate an old Univega that dated back to her college days. She hoped that we would make use of it, and we assured her as much. It’s the objective of this post to show the process we go through to refurbish good-quality older bicycles here at Pedal Rev. The Univega as it looked when it arrived: old and definitely pretty tired. 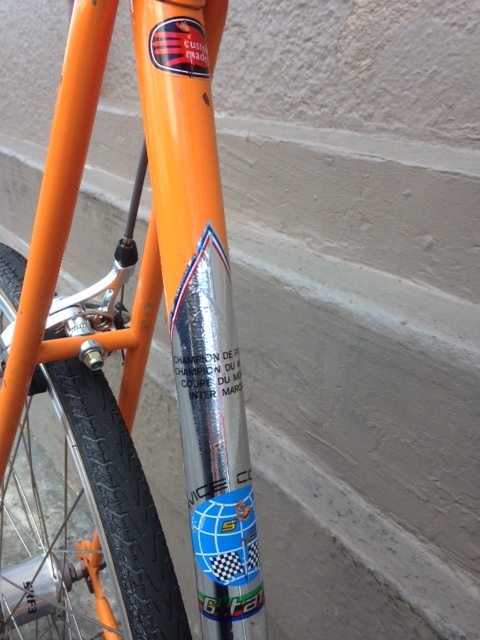 To be a reliable and comfortable bicycle for the next rider, this Univega really needed everything. This started with removing all components from the frame and determining which parts could be re-used. The new Tektro dual-pivot caliper. New, much more powerful, and high-polish silver finish. Original sticker, which I left on. Always interesting to consider the bike’s history. This shop no longer seems to be in business, but it was originally founded by Czechoslovakian pro road racer Otto Rozvoda in the 1960’s. The original stem/handlebar. Not the most comfortable setup for riding around the city. 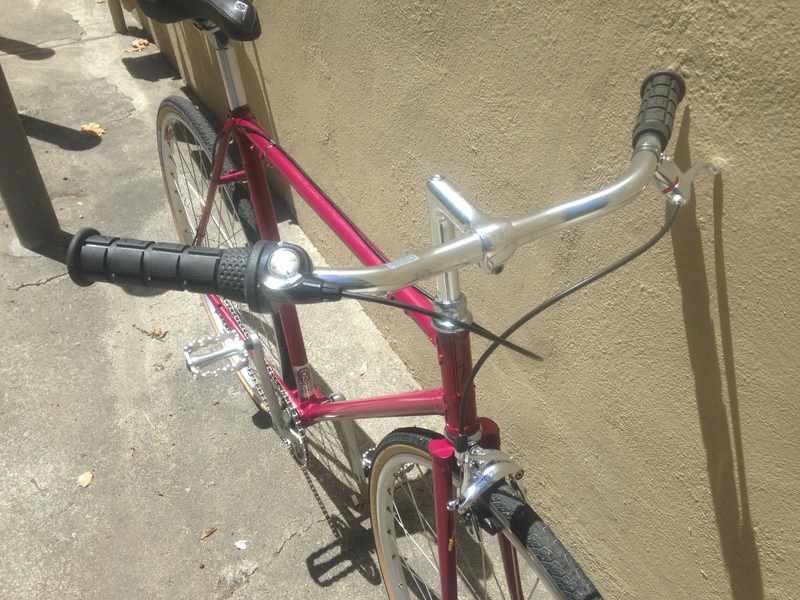 Retro-style brake levers, modern indexed Shimano bar-end shifters, and cork bar tape finished off with some burgundy Newbaum’s. 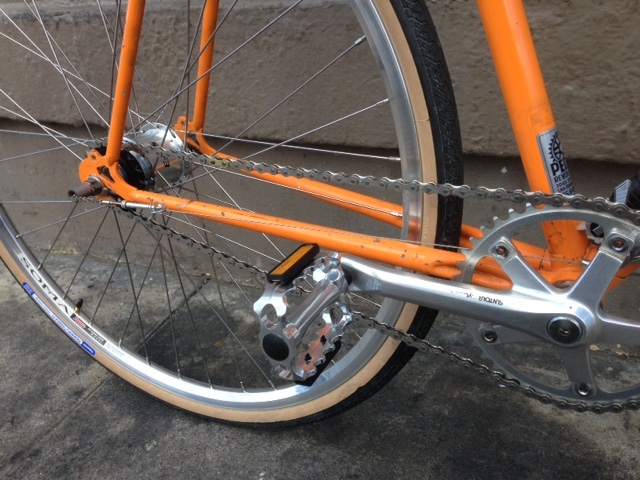 A new derailleur mated to a 9-speed wide-range cassette and original crankset. Got some new MKS Sylvan Touring pedals on there too! 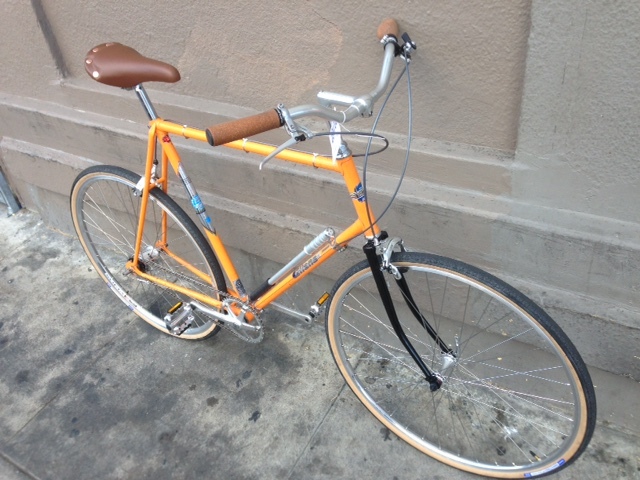 The final product, featuring a new Shimano/Mavic wheelset, Panaracer Pasela 700 x 32 tires, Velo Orange stem/Soma Oxford Bar. Ready for all the urban jungle has to throw at it! She’ll be a good fit for somebody in the 5’3-5’7″ range. Come take a test ride! From what I can gather, 1980 seems to have been a fairly tumultuous time. Americans were being held hostage in Iran as their home country watched helplessly on (at least for the most part). The Soviets were invading Afghanistan, beginning the decades of political instability and human misfortune in that country; in response, Jimmy Carter boycotted the 1980 Moscow Summer Olympics. And the U.S. economy wasn’t doing too well; Reagan was about to perform his trickle-down on America and swell the ranks of the billionaire class. On a more positive and politically unrelated note, the Lakers won the NBA championship and Magic Johnson played a real nice Game 6. Not too sure what was going on over in France, but I do know that Motobecane was still making bicycles. They’d file for bankruptcy in 1981, but this fine Super Touring was ushered off the production line just in time for your cycling enjoyment. Relatively thorough online research leads me to conclude it is indeed a 1980 model. This bike came to us in a pretty unorthodox fashion. A gentleman called the shop a while back and I (Todd) picked up the phone. He explained that he had an old Motobecane he wanted to donate, but would be shipping it to from out-of-state. I tried to suggest that it might not be worth his trouble, but he wasn’t sure what to do with it and wanted the bike to go to good use. So I thanked him and said sure, ship it on out. As it turned out this was one of the better-quality Motobecane frames of that era, built with heat-treated steel tubing and a derailleur hanger. 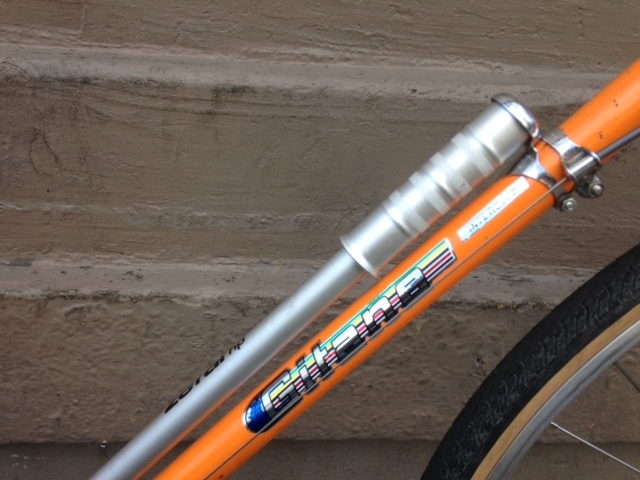 We replaced the damaged original fork with a chrome one, and it’s been built up nicely for stylish around-town use. Nearly all the parts, including the brakes and wheelset, are new. 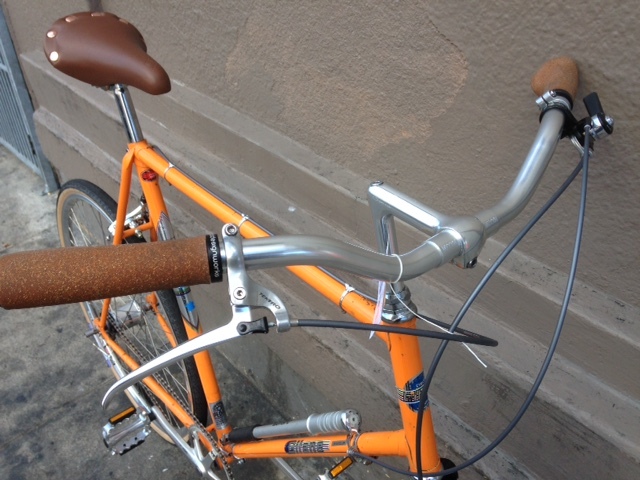 Favorites of mine include the comfortable Soma Oxford handlebar and excellent Suntour ratcheting bar-end shifter. The bike would be a great fit for somebody about 5’10” to 6′. Come check it out today!! This Schwinn Sierra began life as an early era mountain bike and has all the characteristics that made the bikes of that time so versatile: Steel frame, relaxed geometry, long wheel base, low-ish bottom bracket, rack and fender mounts. Early mountain bike design borrowed a lot from classic touring bikes and were designed to be comfortable for off-road touring rather than the popular type of “shredding” style riding done today on contemporary mountain bikes. These early bikes were so robust that a few decades later the frames are still going strong. We love receiving donations of these bikes and rebuilding them as dependable utility commuter bikes. In fact, a current inclination among many San Francisco bike couriers is to use a rebuilt early era mountain bike for delivery, rather than the tried and true fixed gear or steel road bike. They are more comfortable for long days in the saddle, cheap to repair and replace, can accommodate heavy loads, aren’t flashy looking (theft deterrent! ), and can take a beating! This one got the unique treatment of an internally geared Shimano Nexus 8 speed wheelset plus all the other goodies that we love – Continental Touring tires, WTB saddle, upright Wald handlebar, new brakes, and full fenders for the rainy days to come. 21″ fits a taller individual of about 5’11”- 6’2″. Are you or someone dear to you between 6’1″ and 6’4″, dig the color orange, and in the market for a unique town-style bicycle that rides like a dream? 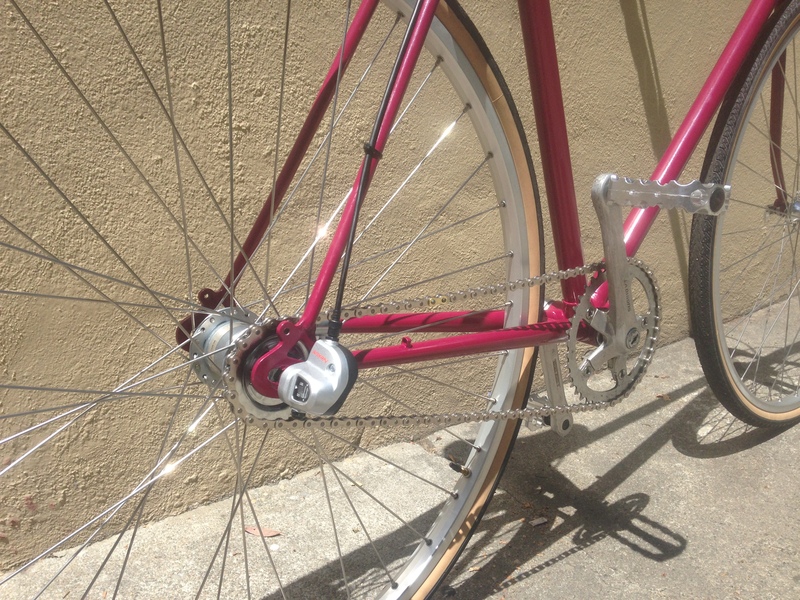 If any of this rings true, you’d best come in to Pedal Rev to check out this Gitane. According to the original sales paperwork provided by the gentleman who kindly donated it to us, this bike cost $165 way back in 1972. It still had all the original parts on it, and the paint is in great shape for its age. But cycling has come a long way since then and major changes were on order; in fact, the frame, seatpost, and matching original Zefal pump are the only items that weren’t replaced. Cool details on this bike include a new polished 3-speed wheel, some vintage Suntour Cyclone cranks, and some pretty wide Nitto handlebars that’ll be well suited to the larger individual who ends up putting miles on this rig. Some ergonomic Portland Design Works grips are comfortable on the hands, and the retro-look Tektro brake levers control new dual-pivot calipers that’ll bring this orange whip to a stop in no time. Come on by and take it for a test ride! Another beautiful Mixte is now available at Pedal Revolution!! This one started its life (like many others) as a Centurion frame from the 1980s–nice quality, light Japanese-made steel. We had it powder-coated the “Cerulean Blue” you see in the pictures and proceeded to build it up with all new parts. The above picture shows the cool textured paint effect!! It’s a true Mixte, with parallel tubes running straight from the headtube to the rear dropouts. Nice looking lugs here. We’ve set up the cockpit of the bike with a Soma Sutro stem, a Velo Orange Milan handlebar, and a set of comfortable leatherette grips. Ergonomic Shimano brake levers (adjusted for smaller hands!!) control dual-pivot Tektro brakes for quick and effortless stopping on any hill this fine city can offer. A Handsome single-ring crankset is mated to wide-range 12-34 gearing. This bike would be a great fit for someone about 5′ tall. Come in and check it out today! Anybody who’s been in San Francisco for a little time, or closely studied a city map, knows that the streets can be extremely confusing–especially for a cyclist. That’s partly because of the hills (if I keep pedaling straight up this hill maybe it’s a shortcut??) but also because of the city’s rapid growth brought on by the Gold Rush. The city really grew like crazy. A quick Wikipedia query put some numbers on what I had already vaguely known: At the beginning of 1848 there were only 1,000 residents, but by 1870 it was a city of 150,000. Getting any type of overarching city plan together must have been nearly impossible. I guess the city is still trying to mitigate the effects of poor initial planning (e.g. the $ 1.5 billion Central Subway), but that’s another story. The story for today, though, is a beautiful 56 cm road bike done up in the beautifully textured “Gold Vein” color (thank you Champion Powder Coating). The frame was a higher-end Shogun from the mid-80’s. You can tell its quality based on the fluted tips of the seatstays, the minimalist cable guides under the bottom bracket, and what I believe are investment-cast Suntour dropouts. Originally this bike came equipped with Suntour components as well, but after the frame got painted it was time to modernize the bike. We’ve put some nice parts into this build. It’s got a SRAM Apex 10-speed drivetrain, Shimano Ultegra brakes (those are some very elegant stoppers, folks), and a nice wheelset with SUZUE sealed bearing hubs. A Sugino 50/34 crankset, MKS UB-Lite pedals, and a Brooks Professional saddle are some more great looking parts that’ll last a very long time. Considering the frame is already gold, we tried to keep other things a little understated. The geometry of this frame was intended for road racing, but we’ve put the Soma Sutro stem and Highway One bar (in the 42 cm width) for a somewhat more upright riding position. It handles very nimbly and is a real pleasure to ride. If you’re around 5’10” or so, she’d be a pretty prime fit for you. Another day, and another gem of a refurbished bicycle is here at Pedal Rev. This cycle started its life as a higher end Mt. Fuji mountain bike from what I (Nolan) believe to be a 1980. This lugged steel steed was created in the magical time when bicycles were expected to do more: your mountain bike was your touring bike, your commuting bike, and your beverage bike. Quality steel, comfortable geometry, copious eyelets and more made this bike an exemplary all-in-one eighties powerhouse. While the Mt. Fuji is a great bike, this particular Mt. Fuji was in a bit of a bad way when it arrived at Pedal Rev as a donation. Distressed paint, and parts worn beyond repair left us wondering: “What were we to do?” Champion Powder Coating provided us with a screaming matte green paintjob (thanks y’all! ), and a new parts build got this bike back in fighting shape. While the bike was originally built with a riser bar, we built it with the cockpit of a touring/randonneuring bike. Randonneuring bicycles seem to be all the rage right now and the newly dubbed Mt. Fuji Destroyer falls in with the best of them. Our Destroyer has traditional road bar/levers and bar end shifters to allow for multiple riding positions. The wide range 3×9 drivetrain give the bike plenty of gears to tackle the hills, while a powerful set of cantilever brakes provide enough Umph! to stop after bombing down said hills. 26” wheels and the perennial Pasela PT tire round out the build. Just when you thought the Destroyer couldn’t get any better, we added some flair in the form of a color correct Velocity H2O cage, and wrapped the drive side chainstay with black Newbaum’s cloth bar tape for a real curated look. The Willys Jeep is (matte) green with envy. This bicycle measures out to a 55cm, and would work be perfect for a rider 5’9”-6’. Come in and put some fun between your legs. Steel bicycles have had a cadre of die-hard fans who appreciate their smooth ride quality and long-term durability. In an era where much of what we consume is becoming more and more dispose-able, short life spans in products are less and less relevant. That fancy new smart phone you just got will soon be overshadowed by the slightly updated version coming out in six months. Fortunately, if you do a little research, a bicycle can still be purchased that will last for many years of consistent service. This custom rebuilt Lemond road bike is a fine example of a classic lightweight steel-framed bicycle that has many years of service to give. Built from Reynolds 853 tubing, this is a performance designated bike designed to go fast and handle quickly. The vibration dampening compliance that the steel frame provides is noticeable when travelling over rough roads or after long hours in the saddle. This bike was refurbished with a well-rounded parts grouping including a Shimano 105 drivetrain and brakeset, brand new Shimano tiagra 9 speed shifters, Soma Highway One compact handlebar, and durable Vittoria Randonneur tires. It’s sized at 54cm and would be a great fit for a rider 5’5″ – 5’9″. As attributes, quick, light, and affordable are generally not found together in one bicycle. Generally you’d have to settle for one or two of the above characteristics. This 80’s Motobecane Grand Touring is a gem of a bike that finds a happy balance between all three. 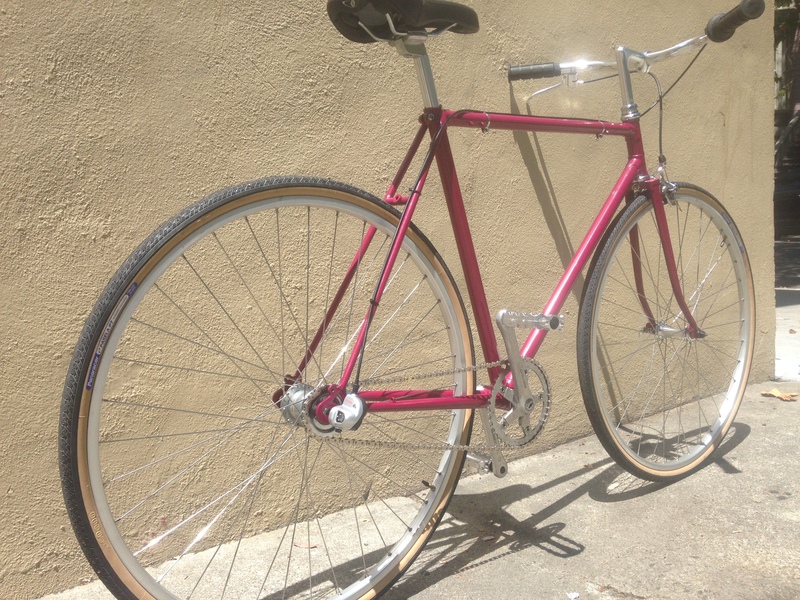 It was rebuilt with a new wheelset, brakes, Soma New Express Terracotta tires, and a Soma Highway one bar. It’s a great mix of old and new at a very reasonable price. 53cm ST – 55cm TT. A great fit for 5’5″-5’9″. 1969 Robin Hood 3-Speed Step-Through – $350 SOLD! In the year 2008, I (Joel) began my career as a bicycle mechanic. 7 years ago this month actually. I worked at Broadway Bicycle School in Cambridge, MA. This shop serviced many old British 3-Speed bikes. It was actually kind of a specialty of the shop. I was tasked with tuning up many of these bikes and let me tell you, at the time, they were the bane of my existence. Compared with contemporary bikes, these bikes are unconventional and quirky as can be (internal gear hubs that are influenced by by their position in the frame, front hubs that are adjusted in the fork, use of metric and non-metric/imperial fasteners, “Raleigh”/26 TPI threading, brakes that are centered with a hammer and punch!…). A real fully equipped city bike! on’t sneer at old 3-speeds. They are serious bikes, built for serious use. They are meant for utilitarian cyclists, and they are still extremely appropriate for riders who don’t usually go more than a few miles at a time. They are particularly at home in stop-and-go traffic, because they can be shifted even while stopped. Their English heritage: full fenders, oil lubrication, and totally enclosed gear system makes them relatively impervious to wet conditions. They may be heavy, but that is not because they were built to be cheap, but because they were built to endure extremely rough usage and neglect. Properly cared for, they will outlast us all. As evidenced by the date stamped on this Robin Hood’s Sturmey Archer hub, this bicycle was manufactured in 1969. In 1969, the guts of the Sturmey Archer AW hub were much the same as in 1902, having survived two world wars, the great depression, the baby boom and several high-profile assassinations fully intact. However, 1969 was a pivotal year of change in the history of Rock N Roll. Anyone in the Bay Area today who happens to catch audio glimpses of traffic reports referencing Altamont must surely be reminded of the ugly events that occurred at the free concert there in December 1969, the edge of the 1970s. As we now know, the Altamount Free Concert was the event that signaled the end of the day glow tie dye days of peace and love. What followed was a decade of earth tones, religious cultism, political assassination, heavy narcotic use, domestic terrorism, disco, escalating imperial war atrocities, and the emergence of punk rock. Around the time I was birthed, The Clash succinctly penned the perfect counter point to the peace and love espoused by the flowerer children of the 60’s, Hate and War (“the only things we got today”). A real theme song for the 1970s. A more positive association one can make with this bike and The Clash is their invocation of Robin Hood in the excellent song White Man in Hammersmith Palais. Perhaps the first of example of White musicians properly doing what Bob Marley would affectionately call the “punky reggae”. As mentioned in the above quote from the Sheldon Brown website, although these are real bikes, they were geared for the flat streets of Nottingham or Manchester (see the below video) England rather than hilly San Francisco. Thusly, the original cottered cranks were replaced with a Velo Orange threadless bottom bracket (mooting the Raleigh threaded bottom bracket shell) and a beautiful Sugino crank fitted with a 42 tooth chainring. This crank is mated to a 23 tooth rear cog and provides excellent gearing for our vertiginous local terrain. Bianchi Advantage “Neon Eggplant” commuter bike. A great quick and lightweight hybrid bike rebuilt and ready for daily use. If you dig purple, come and ride this luminous creature. Sekai Townie Conversion. Japanese built lugged steel Sekai road frame got the Pedal Rev touch and was transformed into a classy more upright riding town and city bike. Full parts rebuild on this great pale gold frame set. Very light and quick for a tall bike. A great late 70’s Peugeot road bike rebuilt and ready for the road. A host of new parts update this classic bike.